I have a dry erase board on my refrigerator, which is intended to be a place for me to write down great ideas when they spontaneously come to me during the mundane times of life. What is actually on my dry erase board is a scribble of quotes from Laverne & Shirley, payment confirmation numbers of bills I’ve paid by phone, pieces of ideas that don’t make a hell of a lot of sense, and names of people I want to “look into” such as the guy I just googled and realized he’s a real estate developer and philanthropist-turned tax evader and witness-tamperer. (Why did I need to know about him?) So my dry-erase board is not the hub of creativity I thought it would be. However, between the bits of information and the numbers, there are a couple “starts” to things, as it were. One line reads “soap in my coffee.” One of my top sensory fears in life. Like fingernails screeching down a chalkboard (something we’ll only read about in books someday) the idea of drinking something out of a glass that has soap still in it is hideous and awful to me. I don’t know why this weird fear began, but somewhere along my awkward road of adulthood, I read or heard that soap could make you stomach sick. I also noticed that sometimes when you pour coffee into a mug, there is a little foaming on top. That “foaming” bubbly thing should disappear after a few seconds. If it doesn’t, there could be soap that was leftover in the mug, and that soap is something you could be ingesting! Oh the horror. For some reason this became something I began looking for. In diners, in restaurants. What if my mug was the only mug that didn’t get properly rinsed!? Usually people who have been through some real troubles in life and have arrived at a point of some perspective can laugh about “luxury problems.” The term can encompass many things on the spectrum of problems that, when you really think about it, aren’t that bad. People might have trouble choosing a vacation spot, or perhaps they are having trouble with their maid service, or maybe their sunroof on their car doesn’t open properly. When compared with real problems, we know the ones above seem silly, and the realization can make us feel a little small. I had to laugh when I shot soap into my coffee earlier this summer. Yes, “shot soap” into my coffee. I buy this stupid organic blah blah glycerin natural whatever hand soap. And I’m never buying this brand again. 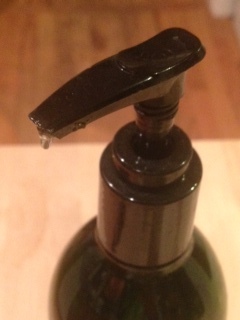 You know that little hardened blob that forms at the end of a lotion or soap pump? Well this hardened blob is the peskiest I’ve ever encountered. It almost completely blocks the soap, so when you push the pump, the soap flies one of several directions, all of which are NOT your hand: my eye (twice), my clothes (several times), and alas, STRAIGHT into my cup of coffee earlier this summer. It happened so fast I couldn’t believe it. And I stood there, and I thought, today’s the day I’ve squirted soap into my perfect cup of coffee. I tried to “fish it out” buuuut soap doesn’t work that way. Luxury problems. Hardened blobs and flying soap. If that’s the worst thing that happens in your morning, life is good. What do I know? If that’s just the start to a really crappy day, life is still good. Just get another cup of coffee. *Ok I lied. I have. This entry was posted in gratitude, Uncategorized, unspoken, writing and tagged coffee, gratitude, writing. Bookmark the permalink. I’m enjoying these, jp. And your luxury probs. thx/pc. Princess needs a hobby or a job………..love it! I never knew this one… I know another fear of yours because you transferred it to me and I’m still dealing with it ;o) Great post! Oh, Princess! So many fears.